Malaria remains an important health threat to people living in endemic countries. Despite international efforts and a dramatic decrease in morbidity and mortality over the last decade, the goal of total eradication is yet to be achieved. One of the main reasons for the survival of the parasite is its ability to develop resistance to all antimalarial drugs introduced to date. Unfortunately, this includes the current frontline Artemisinin-based treatments, for which resistance has appeared in South East Asia and even Sub-Saharan Africa (although the latter is under debate). This man-versus-parasite arms race therefore dictates an urgent need for novel antimalarial targets. Towards this goal, Katherine Amberg-Johnson and colleagues have described a new, potential antimalarial target located within the apicoplast, a vital, Plasmodium-specific organelle originally derived from an alga by endosymbiosis. The advantage of targeting this Plasmodium-specific organelle is to avoid non-specific effects resulting in human toxicity. The prokaryotic origin of the apicoplast has meant that some antibiotics, predominantly those that block prokaryotic protein synthesis, are effective antimalarials. One characteristic of these apicoplast inhibitors is a delayed death phenotype, where parasite inhibition occurs in the subsequent replication cycle following drug treatment. Since fast-acting compounds are most desirable for antimalarial therapy this phenotype has limited the use of existing apicoplast-targeting compounds. For this reason, Amberg-Johnson and her team sought novel compounds (and target identification) based on three criteria. From a screen of > 400 compounds, actinonin was identified as the only compound to fulfil all three criteria (wow, perfect!). The natural-product-antibiotic was shown to act after one replication cycle (criteria 1). In blood-stage P. falciparum the sole function of the apicoplast is to synthesize isoprenoid precursors such as Isopentenyl pyrophosphate (IPP). Apicoplast-specific effects can therefore be rescued by addition of IPP to the growth media. Indeed, they showed a 20-fold reduction in growth inhibition when IPP was given, during actinonin treatment (criteria 2). Using quantitative PCR and microscopy the authors also showed that the organelle was absent from daughter parasites following actinonin treatment under IPP rescue (criteria 3). Good start, now how does it work? The first, logical approach was to consider the target of actinonin in other organisms. In bacteria and mammalian mitochondria (another organelle with prokaryotic origin) actinonin targets peptide deformylase (PDF). However, the authors found evidence to the contrary in P. falciparum……. Actinonin was less potent against the purified Plasmodium apicoplast ortholog PfPDF. Over-expression of PfPDF did not provide any resistance against actinonin. Upstream inhibition of PfPDF (blocking translation) did not supress the effect of actinonin (expected if PfPDF is the target). Not discouraged, the authors decided to change strategy and use a related apicomplexan (also containing an apicoplast) Toxoplasma gondii. The advantage of this relative is that it is easier to grow and more pliable to genetic modification. First, they selected resistant T. gondii (by growing parasites in the presence of actinonin at 3x EC50). Using whole genome sequencing, they found two identical mutations in five out of eight resistant clones. One of them was a gene (TgFtsH1), coding for a protein, localized to apicoplast…. Bingo! An added bonus, TgFtsH1 was located in the metalloprotease domain, coincidently, actinonin is a peptide mimetic, a class of molecules that typically bind to metalloproteases (sometimes all the pieces fit perfectly into the puzzle). In P. falciparum, three TgFtsH1 homologs were found (PfFtsH1). Initially, the group FLAG-tagged PfFtsH1 (at the C-terminus) in an attempt to localise the protein, but this failed. In T.gondi previous reports had suggested cleavage of the C-terminus in their apicoplast. If the same is true for P. falciparum PfFtsH1-FLAG should remain intact in daughter (drug-treated under IPP rescue) P. falciparum parasites that lack an apicoplast. The results matched the hypothesis, PfFtsH1-FLAG was detected in the apicoplast-minus parasites. Next, they down-regulated PfFtsH1 expression and observed a defect in the parasite growth that was rescued by the addition of IPP. Apicoplast loss in daughter parasites further confirmed the involvement of PfFtsH1 in apicoplast biogenesis. Then the time had come to check if actinonin does have an effect on PfFtsH1 (the answer we are all impatiently waiting for). For this, they added actinonin to Knocked-down PfFtsH1 parasites decreasing the EC50 of the drug 58-fold. The mutant line was unaffected by other apicoplast inhibitors, highlighting the target-specificity of actinonin for PfFtsH1. Finally, they investigated the direct interaction between the drug and its target in vitro. After removing the transmembrane domain of PfFtsH1, to obtain a soluble protein, they tested whether enzymatic activity was affected by actinonin (compared to another drug targeting different enzymatic group). The activity was dramatically decreased in presence of the actinonin, confirming the direct inhibition. Through the use phenotypic screening accompanied with a cohort of specific criteria the authors have defined a compound that is whole cell active, specific for the apicoplast and, unlike other apicoplast inhibitors, without a delayed death phenotype. The target of actinonin proved to be particularly difficult to identify. Amazingly, despite it being so elusive, through determination, good fortune and a willingness to change strategy the authors identified PfFtsH1 as the target. 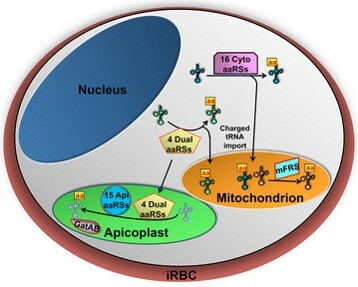 This admirable and creative workflow has provided an exciting, much needed, novel P. falciparum target in apicoplast biogenesis that offers fast-action, parasite specificity and multi-stage activity. I think I speak for all the authors of the paper when I say that we are beyond flattered that our research has been featured here! Since actinonin is far from ready for the clinics, we are hoping to partner up for drug discovery to optimize FtsH1 inhibitors as viable antimalarial therapeutics. Holly is a research associate at Keele University. Her project focusses on the spatio-temporal dynamics of DNA replication in malaria. She is particularly interested in transmission stages and the extraordinarily rapid rate at which male gametocytes undergo DNA replication during gamete formation. Florian is research associate at Keele University within the school of Life Sciences. He is studying G-quadruplexes in Plasmodium falciparum and their role in antigenic variation, using cutting-edge genomic and molecular biology techniques.